With Iraqi, Kurdish and international security forces on the verge of defeating DAESH in western Mosul, the fifth annual Sulaimani Forum addressed the fundamental issues that breed extremism and conflict in Iraq and across the Middle East, and discussed durable solutions to move beyond radicalism. The Forum also considered the short-term security and humanitarian sector challenges facing Iraq, including the plight of internally displaced persons (IDPs) that have fled fighting in Iraq over the past two-and-a-half years. Discussing and debating the pressing short- and long-term challenges was a prestigious and diverse group of government leaders, international experts and respected commentators.The 2017 Sulaimani Forum was delighted to welcome H.E. Prime Minister Haider al-Abadi, who delivered the keynote address and graciously participated in an illuminating one-on-one interview with Mushreq Abbas (NRT Arabic). Other leaders, including current and former ministers and senior officials from the federal government of Iraq, the Kurdistan Regional Government (KRG), the United States, the European Union (EU), the Republic of Turkey, the Hashemite Kingdom of Jordan, the Republic of Egypt, and the Republic of Lebanon, as well as from the diplomatic community in Iraq, were present. Guests and participants also included representatives from the world of academia and research, led by Francis Fukuyama of Stanford University. Other organizations in attendance numbered the Brookings Institution, the Center for Strategic and International Studies (CSIS), the Carnegie Endowment for International Peace, the International Institute for Strategic Studies (IISS), the Boston Consulting Group (BCG), the Wilson Center, New America, the United States Institute for Peace (USIP), the European Council on Foreign Relations, the Strategic Studies Center (Moscow, Russia), the Bipartisan Policy Center (BPC), the National Endowment for Democracy (NED), and the Center for International Private Enterprise (CIPE). Correspondents from CNN, BBC, POLITICO, Economist, New Yorker, NPR, Washington Post, Wall Street Journal, New York Times, Al Monitor, Christian Science Monitor, The Philadelphia Enquirer, as well as all major Iraqi and Kurdish outlets also attended. Over the course of two days of panels and conversations, participants readily acknowledged the core challenges facing the region. For decades, the Middle East has been plagued by repeated cycles of violence, while disputes over territory, resources and power have undermined regional stability and stymied economic growth and social development. Speakers recognized that the horrors of DAESH merely embody the latest manifestation of this malaise, hampering states and societies of the region from meeting their full potential. But with DAESH now losing ground, there was consensus that an opportunity exists for a new beginning. However, if Middle Eastern governments are to chart a different course, participants agreed that regional leaders will first need to address the fundamental issues that have encouraged extremism and driven violent conflict: poor governance, social inequity, widespread youth unemployment, political marginalization, and sub-par economic growth. Without leadership from within to solve these problems, regional states will be unable to complete the move to the virtuous cycle that their populations deserve. 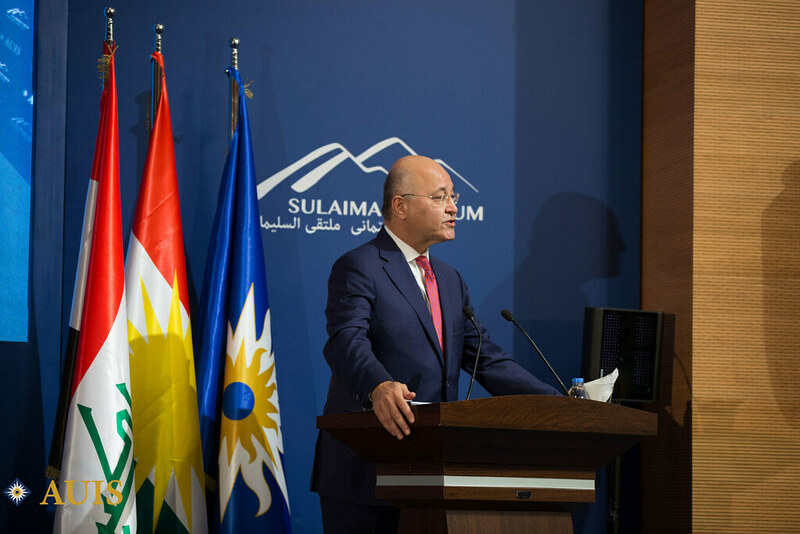 Click here to download the full proceedings of the fifth annual Sulaimani Forum. Videos of the panel discussions are available on our YouTube channel. View and download high resolution photos of the event on our Flickr page. Visit the official website of the Sulaimani Forum at www.auis.edu.krd/sulaimaniforum. Join the conversation! Follow #SuliForum on social media and watch the Sulaimani Forum's Facebook page for updates on upcoming events and publications.